Free your body of toxins, lose the extra weight! Hello Slim is a 30-day teatox consisting of 2 types of tea. With Hello Slim you will lose the extra weight, detox your body, gain more energy and simply relax! Hello Slim is 30-day teatox consisting of 2 types of tea. With Hello Slim you will lose weight, free your body from toxins, get more energy and relax in the evening! 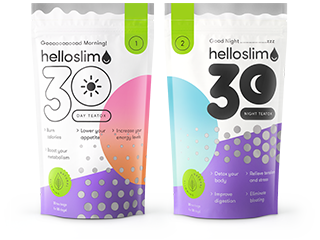 Would you like to know more about Hello Slim? If you haven't found the information you were looking for, we are happy to help. We will answer all your questions. Perhaps you would like to write a review of Hello Slim? Contact us using the form on the right hand side and we'll try to help you!